3/25/13 – Red Sox Fans Unite! When I look back upon the weddings I’ve performed, one in particular stands out. Far out. 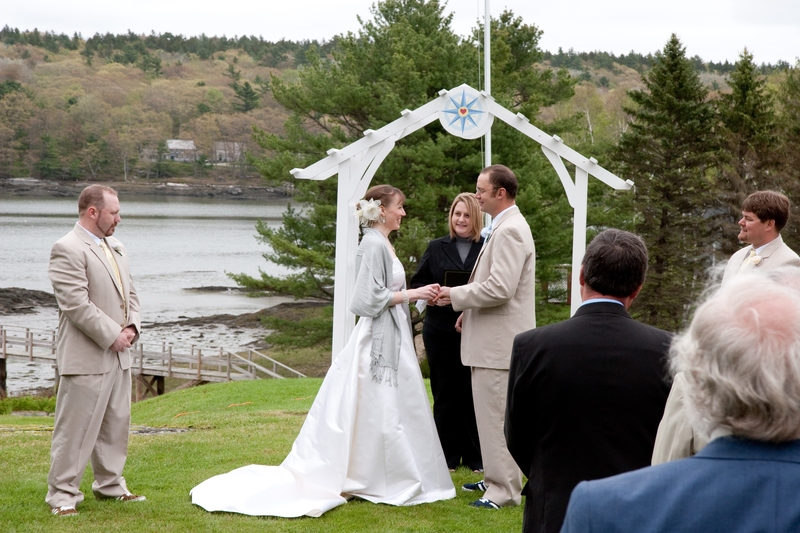 Marty and Jerry planned a May 2011 wedding at a gorgeous waterfront “cottage” on Barters Island. Cottage it was not, but here in Maine we use that term to describe any residence located close enough to the ocean to smell salt water. The gently sloping lawn leading to the water and the grounds around the cottage were beautiful. I’m still not certain that I didn’t see it on the cover of Better Homes and Gardens. The atmosphere was relaxed and offered the much sought after feel of Maine’s slower pace of life. Before I go further, I should provide a bit of background. I did my meet and greet with Marty and Jerry at Marty’s office, after she was off the clock, of course! They finished each others sentences, gazed adoringly at one another, engaged in affectionate teasing, and laughed. A lot. The chemistry between them was magnificent. While they were dating, Jerry had gone out of state for schooling in the marine industry. Over the course of that year, they saw eachother only once or twice. Upon Jerry’s return, life moved forward and they began planning their wedding, which by the way was a green wedding – kudos to them, right?! So, back to the cottage. Chairs facing the water were set up for the guests, a simple white wooden arbor in place. You’ll notice the arbor has a compass on its front. The compass is a meaningful symbol to Jerry and Marty because as Jerry said: “Marty is my compass, she is always guiding me in the right direction”. Don’t you just love Jerry already? Katie Daggett, a local musician, entertained guests while they waited for the wedding party to arrive. I led the guys to the arbor and into their places and we waited for Marty to arrive, escorted down the aisle by her step-dad. Marty’s brother was her “Gentleman of Honor”. You might have guessed already that Marty and Jerry march to the beat of their own drum (and a fine drum I might add – honestly, they are exceptionally great people). So, Marty had no intention of walking down the aisle to Wagner’s Bridal Chorus or Canon in D Major. Instead, she privately arranged for Katie to play a song near and dear to her heart during her entrance. The song was kept secret from all. As Marty and her step-father appeared and began their descent down the hill where Marty was to meet her groom, Katie began playing the most fabulous and soft rendition of Sweet Caroline. Yes, the Mister and Misses are Red Sox fans. There wasn’t one face on that lawn without a great big, wide grin. Now, you don’t have to know a thing about baseball to know what you’re supposed to do in the northeast when Sweet Caroline is being played…Even if it’s during a wedding ceremony. You just can’t plan a moment like this. A goosebumps on your arms, all over body tingle, hair standing up on the back of your neck, lump in your throat moment. And as for Marty and Jerry? Life continues to move forward. Forward in the kind of way that I’m willing to bet that somewhere around their house at this very moment, you’d find a tiny pastel pink Red Sox hat. And likely a matching jersey, too.